We have some exciting news to share with you today about continuing expansion and growth of the Disneyland Resort. For the first time in almost two decades, we will open a new hotel! 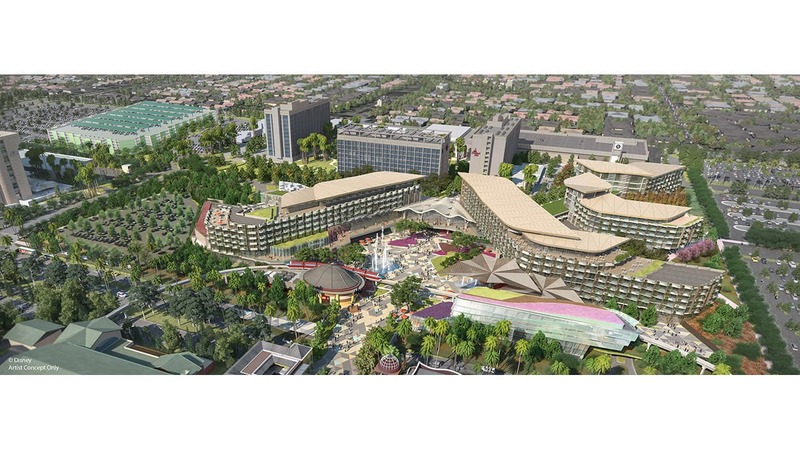 Set to open in 2021, this hotel will transform the west end of the Downtown Disney District and anchor a new gateway to the Disneyland Resort. DLR really needs more options for DVC members. I would love to see DVC rooms added to this new hotel! I think it is fabulous! can”t wait tasty there!! Looks very futuristic and modern. Love, Love, Love! Lisa, yes that is exactly where it will be. It was my understanding that they may include some of the popular restaurants inside the new hotel. As well as the monorail going through it. I do wonder about the look of it. Doesn’t look very inviting. And concerned as well with the path from the Disneyland hotel to Downtown Disney etc. They may reroute past Paradise Pier through Grand Californian. That would be a mess. Will the new hotel have Villas for DVC members? If so, when are points available to purchase? Although I understand their desire for expansion, it is highly unlikely that I personally will ever spend the money to stay in this or any of the other Disney hotels. Would be nice if they would bring in an affordable Disney option. My family and I will, however, miss AMC and Rainforest Cafe. My daughter is going to be devistated. The rain forest cafe has always been a favorite with my kids and me. It has become a new tradition for dinner since the thunder mountain ranch closed down. I hope they just relocate it as there r not many kid themes places to eat in downtown. 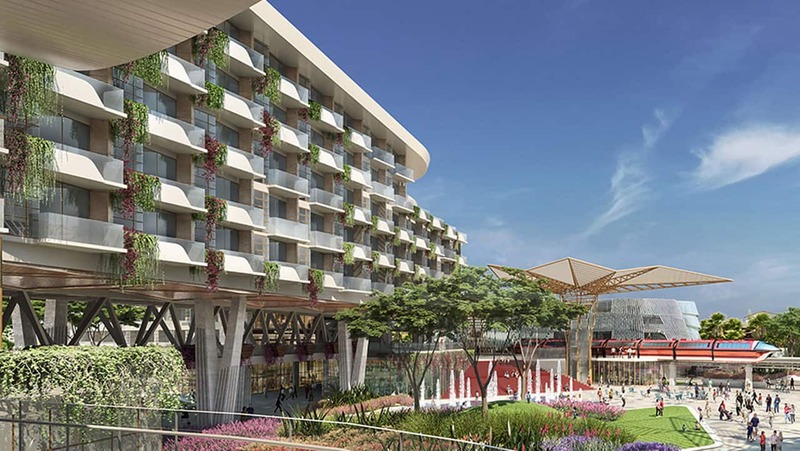 Great addition to the Disneyland Resort, will this hotel emphasis on contemporary look? Or this is not final. I just hope it not some crazy theme like Star Wars. 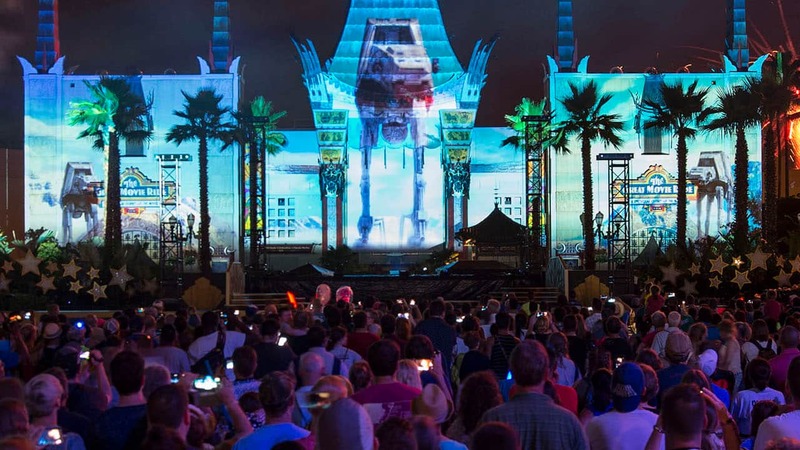 Makes sense to do a Star War theme hotel for Walt Disney World, because of it large vast size. But Disneyland has compact space and look out of place. Yay DVC!! For this property, I’ll add-on directly from Disney on opening day!! Doesn’t look like a pool is planned? Seems like a curious location, right in front of the Disneyland Hotel…I do like having a monorail stop located in a hotel as it used to be years ago. But as an occasional Disneyland Hotel go-er, I worry about the obstructed views this new hotel will cause for guests staying in the Disneyland Hotel. I hope the pin shop on the east side of the monorail platform isn’t affected. I’m sure this whole Disneland Hotel Land will be wonderful! But, is this the reason for no runDisney events next year? I really hope we don’t have to wait for 3+ years for another race at Disneyland. Let us just run around the Parks 3-4 times, I’d rather do that, than run the streets of Anaheim. I’m also on the “Don’t close the Earl of Sandwich” team … a bigger and better location sounds great. Any word on what the hotel’s theme will be? I’m a loyal Disneyland Hotel (DLH) customer and I have to say, I really hate this new location for this new hotel. 1. It looks very intrusive of the pathway to DLH. 2. The first several floors of the Adventure tower at DLH will only have a view of this new hotel. 3. The view of this new hotel doesn’t look very intising, especially for the price it will cost. 4. The new hotel doesn’t look like an enclosed “Resort”. 5. It just looks shoe-horned into the only space available. What happened to the original location? In the current Downtown Disney lot. That would have been right next to the Monorail and had an EXCELLENT view of the park and Star Wars Land. Please don’t close The Earl of Sandwich for this!!!!!!!! Please add some DVC rooms. I already added TWICE to my original allotment of points and I will buy more if you have a DVC section at this new hotel! Man I love ESPN Zone, my family eats there every time we go to Disneyland. I don’t want it to go. I sure have mixed feeling about this. It looks beautiful, but it is unclear where the pool area would be located. I like the idea of hopping on the monorail right at the hotel, but the lines now are usually so long in the morning it defeats the purpose and it is quicker to go to the main gates. I will miss rainforest cafe the most, we don’t have one anywhere near home, so it is a treat for us when we go to Disneyland. I am hoping the price point is closer to DLH then GCH however. Can you provide some clarification? I thought that “4 Diamond” was an award, presented by AAA after a property has been reviewed by their evaluators. Did you mean that the property will be eligible to receive the 4 Diamond award, based on the amenities that will be offered? I forgot to ask, any name for it yet? Will it be Pet Friendly allowing two dogs per room? This is going to be neat, but I have to say… You MUST give Earl of Sandwich a new location! Put it inside the new hotel, or somewhere else in Downtown Disney. But you absolutely can’t get rid of it. It’s the only reason I ever go to Downtown Disney, and it’s clearly popular because it’s always busy. As long as Earls gets a new location, this is great. Otherwise, I won’t have a reason to go out and shop around Downtown Disney at all. The Monorail station built inside the hotel will have adnission scanners just like you are entering the park with paid admission only. So obviously if you are aboard a monorail and are passing through the hotel, you will have a paid passport into the park. No need to worry, the Monorail will still remain an attraction at the Dianeyland Resort for all to enjoy. I believe I see a rooftop lounge! Yes, you are right. These concept designs do remove the current AMC and Rainforest Cafe. Which is indeed quite distressing. I used to enjoy staying on property here as it had all the wonderful things I love about your country. Now I’m not so sure. This I suppose is another reason Disney should have bought GardenWalk when it was up for grabs. It is where the movie theatre and ESPN Zone and those are. DVC all the way!!! It will be nice the have more opportunity to visit the Disneyland Resort. It is VERY difficult to get a villa at Grand Californian. The OC Register mentions that the new hotel will be located in space currently occupied by AMC, Earl of Sandwich, Rainforest Cafe, and ESPN Zone. Say goodbye to the movie theatre, Rainforest Café, ESPN zone, and Earl of Sandwich! Is this going to be a DVC property also? Would love to see more availability at Disneyland Resorts for DVC. We were really disappointed to not be able to use DVC while we were out there. The Disneyland Hotel was nice, but nothing compares to the homelike feel of DVC properties! Lisa, that’s exactly what it looks like. And placing it before the Disneyland hotel is interesting. I thought they were buying other land for this. Will there be any space allotted for DVC? is it me or does the hotel stand where the movie theatre and Earl’s and Rainforest Cafe currently sits?